Courtesy of South Coast Natural Resource Management Inc. The Future Farm Industry Cooperative Research Centre and South Coast NRM are holding a Perennials for Profit Regional Forum on 26 February Dog Rock Convention Centre, Albany, to launch of the EverGraze Regional Package (ERP). The ERP is an innovative delivery approach, developed through research which has recognised that technology needs to be placed appropriately to a farming systems context for regional and individual business needs. The regional forum will help you understand the perennial pasture options applicable to farmers on the South Coast of WA – its aim is to assess what can be profitable and where and at what scale perennial pastures could be grown. Information provided at the event will inform land managers on whether the use of perennial plant technologies can improve the capacity for dryland agricultural systems to adapt to climate change. A number of leading Australian researchers, agricultural practitioners and innovative local farmers will present on what they have learnt from the EverGraze program. The role of perennials in South Coast Farming Systems – including adaptation to climate change. Key drivers of profit and NRM issues addressed in the WA regional package. The role of annuals in perennial systems. What’s on the horizon? Panic, messina, fodder shrubs, summer sowing. The EverGraze Regional Forum will be supported by the Future Farm Industries CRC, South Coast NRM, the Australian Government’s Regional Landcare Facilitator Program and the West Australian Government. Holbrook Landcare is hosting a Sustainable Agriculture Forum on Friday the 28th of February. Titled ‘Farming our Soils: Farming our Landscapes’, the Forum will address a wide range of farming issues, while recognising the fundamental importance of soils. Holbrook Landcare Network Chair, Tony Geddes, is keen to learn more about managing our soils. This forum will bring together soils researchers Dr Susan Orgill (NSW DPI) and Dr Gupta Vadakattu (CSIRO), to give an overview of what we know and what we don’t know about soil carbon and soil biology respectively, alongside farmers John Ive ( Talaheni, Yass) and Vince Heffernan (Moorlands, Gunning), who have made a success of adapting to soils and landscape issues to create sustainable farming businesses. Other speakers in the afternoon session are Dr Leah Moore (University of Canberra) who will present the findings from local hydrogeological surveying , and Kate Sargeant (VIC DEPI) discussing results and what’s been learned from the EverGraze work. To stimulate some new perspectives on our landscape, after a barbecue dinner the Forum will end with an historian speaking. Professor Bill Gammage will give a talk based on his book The Biggest Estate on Earth: How Aborigines made Australia. This presentation will provide food for thought about the role of fire in our landscapes. New online tools and information to help manage feed supply and maintain ground cover over the summer-autumn period are now available from EverGraze. Together with Meat and Livestock Australia (MLA) and Australian Wool Innovation (AWI), EverGraze is providing a variety of tools to help optimise pasture use and composition, while preventing overgrazing. EverGraze National Project Leader, Kate Sargeant (Victorian Department of Environment and Primary Industries), said tools such as The Nuts and Bolts of Grazing Management provide the principles and guidelines to planning and monitoring pasture use to achieve the best outcome for any given farm. “The Nuts and Bolts of Grazing Strategies is a helpful starting point and explains how to establish benchmarks for Feed On Offer (FOO) and herbage mass to meet livestock and pasture requirement,” Ms Sargeant said. To assist with feed budgeting, the EverGraze website also hosts pasture growth rate (kg/ha/day) tables and graphs for high rainfall regions across Australia. It also links to AWI’s Feed On Offer (FOO) library, which helps users to estimate FOO and nutritive value of grazed pastures. The library includes 500 records collected by agronomists across Vic, NSW, QLD, WA and SA, from typical pastures in each region in summer, autumn, winter and spring with a range of FOO values at each harvest. For more information, visit the EverGraze website www.evergraze.com.au or the AWI FOO library www.feedonofferlibrary.com. Sheep and cattle producers throughout the high rainfall zone of Victoria and southern NSW now have access to new regionally relevant information to help manage their pasture and livestock systems. The EverGraze team has added a comprehensive pastures component to the regional package for ‘North East Victoria, South West Slopes NSW, South West Victoria (Upper)’. The pastures information incorporates 10 years of research and on-farm demonstration, and provides fact sheets, tools and calculators for producers to assess options for improved pasture management. EverGraze National Project Leader, Kate Sargeant, from theDepartment of Environment and Primary Industries (DEPI) said this particular region shows a high degree of variation in climate, soil, altitude and aspect, placing limitations on what pasture species will grow and how they will perform. “This newly released pasture information draws together principles of pasture management and provides recommendations, including photos, for species use and management that are supported by evidence from local research and demonstrations,” Ms Sargeant said. Information from the North East Victoria, South West Slopes NSW, South West Victoria (Upper) regional package will also be presented at a series of field days coming up in North East Victoria and Southern NSW. Ms Sargeant will discuss the regional package at the Holbrook Landcare Group Sustainable Agriculture Forum on 28 February. Contact Raylene Brown for more information on (02) 6036 3181. 20 January 2014 – Future Farm Live! ‘Future Farm Live’ will present the culmination of 13 years’ research by Future Farm Industries Cooperative Research Centre (CRC) and its predecessor CRC Salinity. The interactive event will include a range of sessions incorporating videos and panel discussions featuring farmers, researchers and extension teams, with questions from the audience also encouraged. Sessions will highlight improvements to livestock and cropping systems, and the development of biomass systems based on woody crops suited to marginal land. There will also be a focus on new products and technologies developed and delivered by the CRC, and the biodiversity and water research that underpinned the CRC’s work. A further highlight of the day will be a recorded ABC Radio National ‘Big Ideas’ panel discussion, hosted by Paul Barclay, examining issues facing the future of Australian agriculture. Panellists will include some of Australia’s leading thinkers on agriculture, climate change, and research and development. CEO, Peter Zurzolo, said Future Farm Live is an opportunity to highlight the great results that come from a successful collaboration between the University sector, agricultural RD&E organisations, industry and farming communities – all coordinated from within the structure of the federal government’s CRC program. “Future Farm Live will not only demonstrate our research teams’ achievements in an engaging way, but also how these achievements shared between our 16 partners flow on to benefit the broader agricultural industry and community in general,” said Mr Zurzolo. Holbrook – John and Anne Keogh: Implementing whole farm grazing strategies in southern NSW Murmungee – Judy and Chris Griffiths: Improving the productivity of Microlaena-based native pasture Warrak – Mark and Ange McKew: Managing hill country- challenges and benefits Casterton – Tim and Richard Currie: Curries – Sheltering their lamb income. The achievements and contributions of two leading researchers working with the Future Farm Industries CRC were recognised at a recent presentation in Canberra. 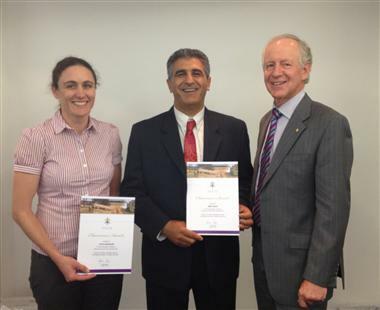 Dr Amir Abadi, Department of Parks and Wildlife WA (DPaW) and Kate Sargeant, Department of Environment and Primary Industries Victoria (DEPI), were both presented with the Chairman’s Award during the November meeting of CRC Directors and Participants. Dr Abadi is a Senior Principal Scientist with DPaW who has made strong contributions to a broad range of projects across six years with the CRC, and is consulted widely both within and outside the organisation as a key interdisciplinary figure known for his understanding of farming systems and strategic approaches to economic modelling. Ms Sargeant is a grazing systems specialist with DEPI, and the national leader of the CRC’s EverGraze program. She has been involved with EverGraze since 2007 and is responsible for coordinating and supporting the collective activities of six regional advisory groups, a national advisory council, and a considerable research and extension team. In presenting the awards to Dr Abadi and Ms Sargeant, CRC Chairman Andrew Inglis said both researchers had made long-lasting and important contributions to the CRC’s research. “Amir’s work has provided the economic underpinning for all aspects of the New Woody Crop Industries program, and he has made an exceptional contribution to knowledge development in the climate change and bioenergy arena, including the EverFarm project which examined the role of perennials within existing and climate change scenarios in Western Australia,” said Mr Inglis. “Kate has used her considerable skills in a range of on-farm and research areas, including designing and implementing the EverGraze Whole Farm Grazing Strategies program. Now, in the final phase of the project, Kate is leading the development of EverGraze regional packages which provide farmers with locally relevant information compiled from ten years of national farming systems research findings.” Both recipients were surprised and delighted to be recognised, and acknowledged the support and collaboration of team members across the agencies involved in their CRC projects. The Chairman’s Awards began in 2010, with nominations provided to the CEO who then makes recommendations to the Chairman. Dr Abadi and Ms Sargeant join the distinguished company of Mike Ewing (UWA), Brian Dear (CSU), Rick Llewellyn (CSIRO), Dean Revell (CSIRO) and Daniel Real (DAFWA). Regionally relevant information for using perennial pastures in high-rainfall zone farming systems is now just a click away, with the launch of the new EverGraze website. The new site at www.evergraze.com.au has replaced its predecessor with the next generation of regional information packages, research outcomes, tools and training for livestock producers and the broader agricultural industry. National EverGraze Project Leader, Kate Sargeant (DEPI Victoria), said the website will act as a fitting legacy for the research and demonstration carried out by a dedicated team across six large-scale research sites and more than 60 on-farm demonstration sites in NSW, Victoria, WA, SA and Tasmania between 2003 and 2013. “For the first time, the results from EverGrazeresearch have been presented as regionally relevant information packages, which provide recommendations to farmers for managing perennial pasture and livestock systems across the high rainfall zone of southern Australia,” Ms Sargeant said. Within the regional packages, information is provided according to each region’s soils, climate, pastures, livestock systems, and key production and environmental factors. Research from EverGraze and other related projects, as well as local case studies and demonstration sites, provide evidence-based options and key messages to address the issues and opportunities for improving farm profit, risk and natural resource management. “This is just the beginning! In developing the website, the team has concentrated on providing recommendations from EverGraze research and related projects, and we are still working on completing the story,” Ms Sargeant said. “EverGraze has produced over 300 resources, including case studies, fact sheets, conference papers, research papers and newsletters, and all will become available as the website continues to be populated. While some pages have less detail than others for now, information will be added until complete, as well as packages for new regions. EverGraze is a Future Farm Industries CRC research and delivery partnership with Meat and Livestock Australia, Australian Wool Innovation, Department of Environment and Primary Industries Victoria, Department of Primary Industries NSW, Department of Agriculture and Food WA and Charles Sturt University. For further information on the workshops and research, visit www.evergraze.com.au. Register on-line for these workshops at http://www.surveymonkey.com/s/SQ6PH5Z Or contact Leanne Sherrif on 0429 329 349 or Andrew Bailey from Making More from Sheep on 0408 129 373. The course will be delivered by Lisa Miller, Department of Environment and Primary Industries and Lisa Warn, Melbourne University Makinnon Project consultant. The course is supported by the national EverGraze project. Please contact Lisa Miller at DEPI Geelong on 03 52 264070 or email lisa.miller@dpi.vic.gov.au. Results from the EverGraze Supporting Sites project have confirmed practice change by producers on more than 200,000 hectares across south-east Australia between 2009 and 2012. These impacts result from changes to the feedbase through establishing perennials, combined with grazing, soil and livestock management changes. The increase in production per year from Supporting Site participants who made or intend to make feedbase and grazing management changes is estimated to be between 3.5-5.0 million kg of lamb, over half a million kg wool each from prime lamb and wool enterprises, and more than 14 million kg of beef (live weight). The data also indicates that further change and intention to change ewe management will result in more than 40,000 extra lambs weaned per year. EverGraze project leader Kate Sargeant, from Department of Primary Industries (DPI) Victoria, said the results reveal many positive outcomes. “Importantly, almost all Supporting Sites reported that perennials had persisted as a result of using the EverGraze principles of ‘Right Plant, Right Place, Right Purpose, Right Management.’ Not only were there productivity increases, but also environmental benefits of increased ground cover, fewer weeds, reduced soil loss, and groundwater recharge.Therefore the overall results demonstrate that the dual targets of production and environmental benefits have been met.” The project received support through the CRC and its participants, with additional funding in phase two from the Central Highlands Agribusiness Forum (CHAF) and the Australian Government’s Caring for our Country program. Sessions will run from 9:30am to 3pm and will be fully catered. For information or to RSVP contact Sam Ellis on mobile 0408 922 712 or email sam.ellis@dpi.vic.gov.au. Results announced at the recent Euroa demonstration site field day continue to demonstrate the value of productive perennials for whole farm grazing strategies, with an average of 400kg beef/ha turned off the plots over the last three years. Over 80 people attended the day to hear a combination of specialists provide information on the production, persistence and payback of the five perennial pasture species on site. The site, funded by Meat & Livestock Australia (MLA) and Department of Primary Industries (DPI) Victoria on John Kelly’s property, was established to provide local farmers with the information so that they could see for themselves which were the most productive and persistent perennials for their environment; learn how each species needed to be managed; and understanding the profitability and payback of establishing perennials in the first place. “We found the biggest area of interest was the dramatic increase in clover percentage this year, with an increase of six per cent in late winter 2011 to 22 per cent in late winter 2012. There was also consistently high performance of the tall fescue over the course of the demonstration site, especially in the number of grazing days and kilograms of beef/ha it was able to produce,” Ms Desmond said. More information on the EverGraze principles is available. Farmers and agribusiness consultants will hear the latest EverGraze research at two grasslands conferences in late July. EverGraze, Future Farm Industries CRC’s future livestock production program, is well represented at the Grasslands Society of NSW conference in Wagga Wagga from 24-26 July, and at the Grassland Society of Southern Australia conference in Launceston from 25-27 July 2012. CRC research director John McGrath says the breadth of information being presented at the conferences demonstrates the value and need for practical outcomes from agricultural research. “Our research programs, especially EverGraze, are relevant for farming practices across southern Australia, and we’re pleased to be able to provide options for farmers and agribusiness to increase farm profitability,” said Dr McGrath. EverGraze is sponsoring both events. More information on the conferences can be found at the Societies’ websites: www.grasslandnsw.com.au and www.grasslands.org.au. A successful EverGraze Lamb Survival event was held in Casterton on the 15 June. 75 participants from South Australia and south west Victoria came together to discuss the challenges faced by all lamb producers in pursuit of increased lamb survival rates. EverGraze believes that productive perennial pastures have a role to play in delivering improved lamb survival rates by providing a reliable feedbase that will help meet ewe nutritional targets throughout the year. They have the propensity to extend the growing season, utilise more water and respond to opening autumn rains quicker than those systems that rely heavily on annuals. They have also proven their worth as hedges at the Hamilton Proof Site significantly reducing the risk of lamb mortality through the provision of shelter. The feedback from the event was overwhelmingly positive. Some of the things producers planned to incorporate into their daily management included; more shelter into the exposed paddocks with tall wheat grass hedges or shelter belts, reduce twinning mob size to minimise mis-mothering, scanning to better allocate feed resources to twins, improve ewe nutrition in the last 60 days, and more monitoring of ewe condition and pastures. What’s happening in EverGraze research? During 2011-12, EverGraze research at Chiltern and Orange is continuing to investigate the economic and environmental benefits of rotational grazing and fertiliser on native pastures. At Chiltern new work to determine the effect on meat quality of finishing lambs on improved versus native pastures is being undertaken. Tamworth continues research on the productivity and persistence of lucerne/grass mixtures. Our improved pasture sites at Hamilton, Wagga Wagga and Albany have, for the most part, come to a close. You will have the opportunity to hear the final results at field days at Hamilton on December 1 and Wagga in Autumn next year. From now until 2014, the research teams will interrogate their research results with computer models, which simulate livestock systems over many decades. This will achieve a better understanding of practices which can be integrated into regional packages. New species and varieties developed by Future Farm Industries CRC including lotus, new varieties of fescue, phalaris, cocksfoot and tropical pastures will be included in the models to determine the potential for these to improve EverGraze systems.